The story of the fisherman Heiji is based on a legend about the poaching of fish on forbidden grounds. It was dramatized first as the Noh play Akogi and later several versions were produced for the puppet and Kabuki stage. Heiji's mother has been ill for a long period. The doctor tells him that the only way to cure his mother is to catch a rare fish called a yagara, which can only be found in Akogi Bay. Fishing there is prohibited because it is a preserve of the Grand Ise Shrine of Ise. Nevertheless, Heiji casts his net into the bay, but instead of a yagara he brings up a precious sword. At that moment Heiji is discovered by another poacher, Jirozō, who beats wooden clappers to sound the alarm on the discovery of a poacher. In the ensuing struggle, Heiji manages to escape but his straw raincoat and sedge hat remain in the hands of Jirozō. Before long the local magistrate comes to Heiji's house to arrest him, but when Heiji offers to surrender himself, Jirozō interferes, stating that it was he who was the offender. As evidence he shows the sedge hat bearing two Chinese characters 'hei' and 'ji', saying that they do not represent Heiji's name but are the initials of Jirozō's family name, 'Hiragawa', (the character for 'hira' can also be read as 'hei' and his given name is 'Jirozō'. The magistrate accepts this self-sacrificing interpretation, clearing he way for Heiji to return the imperial sword to his former master, General Tamura, in Kyoto. Arashi Rikan II as Akogi Heiji commemorates a scene from the play Seishū Akogi-ga-ura (勢州阿漕浦). 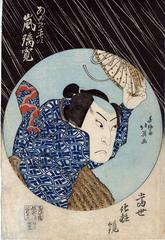 This is the last of a series of roundel bust portraits designed by Hokuei between 1833 and 1835. (another in the series). Each print in the series bears the title 'Contemporary Make-up Mirrors'. No one seems to agree on the exact date of this print. The Museum of Fine Arts in Boston gives it as the 8th month of 1830. Their dating follows Matsudaira's in Kamigata yakusha-e shūsei , vol. 2 (1998), #263 which gives an even more precise date of 1830, 8 month, 7th day. The Metropolitan Museum gives 1835. Waseda University gives the 5th month of 1834. Between the third and ninth months of 1835, Rikan was apparently on tour. This print might have been issued to commemorate either his departure from or return to Osaka, but the print itself depicts a performance that was actually given in Nagoya in the sixth month'. 1) Stars from the Stage in Osaka: Early 19th-century Japanese Kabuki by Matthi Forrer, p. 64, accompanied by a large black and white illustration. The is also a large color illustration on page 33. 2) Osaka Prints by Dean J. Schwaab, #167, p.169. 3) Ikeda Bunko, Kamigata yakusha-e shūsei (Collected Kamigata Actor Prints), vol. 2, Osaka, 1998, no 263. There was a 1922 silent film entitled Akogi Heiji.